Elastic Bandage Net Caps are consisted of large, medium, and small three specifications. Type A Tubular Elastic Net Bandages are applicable to any part of the body, especially applicable to bandaging wounds head, face, neck, shoulders, joints and severed stump, consisted 11 specifications from A1-A11 Type B elastic bandages are applicable to all surgical operations needing pressure bandaging, such as orthopedics operation bandaging, joint fixation bandaging, skin grafting bandaging, breast cancer operation bandaging, lower limb varicosity operation bandaging and cardoic catheter intubation operation bandaging. They are divided into the following specifications as per width : large size (12cm), medium size (10cm), small size (8cm). 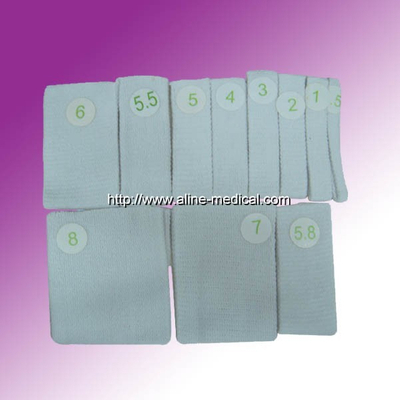 Type C bandages are consisted of chest belts, waist belts and abdomen belts, with four specifications; extra large size; large size; medium size and small size. Different shapes are available by cutting for the purpose of applying to shoulders, chest, abdomen and buttocks.